We made this practically ages ago, bit I kept the picture and remember it being delicious. One of this meals where you’re surprised that such simple ingredients can be so delicious. And it’s super easy so that sweetens the deal! We found it….Mark Bittman’s Food Matters Cookbook, but he put it in Runner’s World, too. We made it…Using cherry tomatoes instead of whole tomatoes since those are better this time of year than larger ones. I put olives in mine but let Chris skip them. 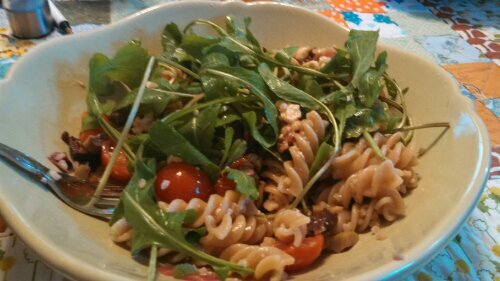 We almost forgot the arugula which is why it’s less wilted, and I liked it that way. We didn’t bother to let things sit because we were hungry and impatient. It was fine and only got slightly better the next day. We thought…This was so simple and really tasty. The bulgur didn’t seem to make much of a taste difference, but I do think it helped to bulk it up.